The Kelley Watson Fellowship recognizes a student who exhibits academic excellence and leadership and has excelled in the core courses during the first year of graduate study. 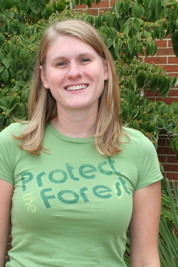 The fellowship is named in memory of Kelley Watson, a member of the incoming class of September 2000 who impressed her teachers and fellow students with her enthusiasm, commitment to academic excellence, and strong promise for a successful marine science career. This year the core course instructors have enthusiastically selected Kristina Hill for the Kelley Watson Fellowship. Kristina Hill excelled in her first year, receiving all “A”s in the core courses and demonstrating strong leadership in both her classes and the laboratory. Her enthusiasm for marine science is infectious. Her prompt start on her thesis research during her busy first year of classes reflects her dedication, and speaks to great promise for a successful career in marine science. She already has a first-author publication ready for submission that will revolutionize the systematics of an important group of oyster pathogens, and she received an award for her very first oral presentation at an international conference. She has demonstrated intelligence, enthusiasm, creativity, motivation, attention-to-detail, good humor, and high integrity. Kristy is a most worthy recipient of the Kelly Watson Fellowship.